Summary: A brief tutorial on the science behind stem cell therapy. Doctors already use stem cells to treat blood diseases, a cell-based therapy that has saved the lives of thousands of children with leukemia. Additionally, physicians used stem cells to successfully treat some types of bone, skin, and eye injuries and diseases. The potential of stem cell therapies is enormous, and some researchers feel that we will be able to regrow organs in the near future. Stem cells replenish damaged tissues and serve as an internal repair system of our bodies. Stem cells have the remarkable ability to develop into many different cell types in the body. They divide without limit to replenish other cells and repair damaged tissue. The chronic diseases of aging such as heart failure, Parkinson’s disease, and diabetes affect millions of people. The underlying disease permanently damages tissues and organs, turning these conditions into lifelong, chronic diseases. Researchers are developing ways to use stem cells to repair damaged tissues and organs, reversing some of these disorders. 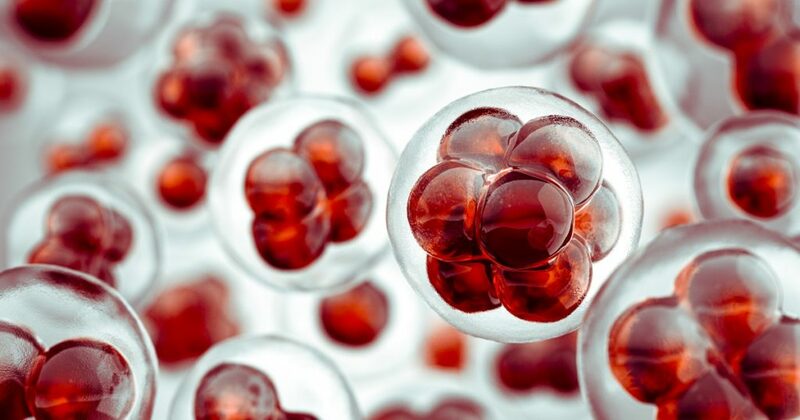 When a stem cell divides, each new cell has the potential either to remain a stem cell or become a specialized cell, such as a red blood cell, a brain cell or a muscle cell. Stem cells are distinguished from other cell types by two characteristics. First, they are unspecialized cells capable of renewing themselves through cell division. Second, under certain conditions, scientists can coax them into transforming tissue- or organ-specific cells with specialized functions. In some tissues, such as the gut and bone marrow, stem cells regularly divide to repair and replace worn out or damaged tissues. However, in other organs, however, such as the heart and pancreas, stem cells only divide under special conditions. Although most stem cells are immortal, stem cells spend most of their time dormant, and only become activated when called upon by chemical messengers called activating factors, to heal wounds and restore tissues. The excitement started in 1981 when researchers discovered how to derive embryonic stem cells from mouse embryos. Eventually, scientists learned how to derive stem cells from human embryos, human embryonic stem cells, and how to grow these cells in the laboratory. The scientists created these embryos for in vitro fertilization procedures to use in reproduction and donated the unneeded ones for research with the informed consent of the donor. Human cells fall into two broad categories and can be either germ cells (eggs and sperm) or somatic cells (all of the rest). When a sperm cell unites with an egg cell, they give rise to the starting point of human life. This fertilized one-celled egg is called totipotent because it has the potential to give rise to any human cell type. Totipotent stem cells can transform into heart, blood, liver or brain cells, and any all other types of human cells. The first few cell divisions in embryonic development produce more totipotent cells. After four days of embryonic cell division, the totipotent stem cells begin to specialize and move on to the next phase of development. On the fourth day of embryonic development, the ball of cells forms itself into two layers. The outer layer will eventually become the placenta, and the inner mass will ultimately transform into the tissues of the developing human body. These inner cells can form nearly any human tissue, but cannot do so without the outer layer, making them pluripotent instead of totipotent. These pluripotent stem cells continue to divide and begin to specialize even further. Embryonic Stem Cells are considered to be ‘the ultimate stem cell’ because they can divide an unlimited number of times while maintaining the potential to differentiate into derivatives of all three germ layers. Even after months and years of growth in the laboratory, embryonic stem cells still retain the ability to form any cell type in the body and offer an exciting opportunity to develop new treatment strategies. Embryonic stems cells get their powers because they come from embryos at an early stage of development, at a time in which the cellular machinery is geared toward the rapid expansion and diversification. Embryonic stem cells, however, are not good candidates to be used directly as treatments, as they require careful instruction to become the specific cells needed to regenerate diseased or damaged tissue. If not properly directed, these stem cells may overgrow and cause tumors when injected into the patient. 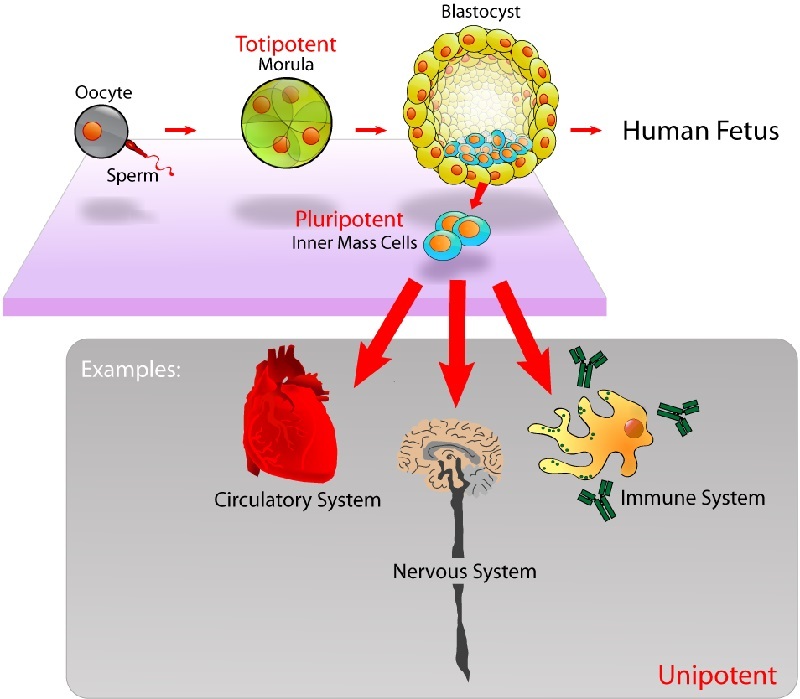 The offspring of pluripotent cells will eventually become the forerunners of specialized cell lines such as nerve cells, blood cells, and skin cells. At this stage, the stem cells are multipotent, because they can transform into any one of several types of cells within an organ. For example, multipotent blood stem cells can develop into platelets, red blood cells, or white blood cells. In recent years, researchers have discovered multipotent stem cells in adult humans. These adult stem cells (ASCs) are used to replace cells that have died or lost function. Researchers have shown that ASCs can replenish a variety of tissues including brain, GI tract, muscle, and blood. Scientists speculate that adult stem cells exist in many other organs, but they have not identified all of them yet. Researchers discovered that they could coax ASCs into transforming into a more youthful and useful state into what looks and acts like embryonic stem cells. These converted ASCs can generate almost any cell type the body might need. A little over ten years ago, researchers discovered how to reprogram adult cells into behaving like embryonic stem cells. Up until that time researchers with two kinds of stem cells: embryonic stem cells and non-embryonic adult stem cells. They called this new creation ‘induced pluripotent stem cells (iPSCs). These ‘man-made’ stem cells are an important breakthrough because they can potentially repair damage in fully grown adults. In the tissues of the muscle, brain, and bone marrow, adult stem cells generate replacements for cells that are lost to injury, disease, or normal wear and tear. Given their unique regenerative powers, stem cells offer new potentials for treating diseases such as diabetes and heart disease. However, scientists still need to do more work in the laboratory and the clinic to understand how to use these cells to treat disease, in a specialized field called regenerative medicine. A storm of controversy surrounds the use of embryonic stem cells in research. In this technique, practitioners create stem cells using somatic cell nuclear transfer and then use the intermediate product to generate iPSCs. Opponents liken this technique to human cloning and say it involves abortion. Another controversial practice is stem cell therapies derived that use umbilical cord blood. Despite the controversy, the FDA has already approved five stem-cell products derived from umbilical cord blood, for the treatment of blood conditions and immunological diseases. The chronic diseases of aging such as heart failure, diabetes, and Parkinson’s disease affect tens of millions of people worldwide. The underlying illness permanently damages organs and tissues, turning these conditions into lifelong, chronic diseases. While doctors have developed medicines that treat the symptoms, they have not developed safe and effective treatments to replace damaged tissue or restore organ function. Stem cell therapy promises a solution, using induced pluripotent stem cells (iPSCs), as well as embryonic stem cells and adult progenitor cells. These stem cells are renewable sources of fully functional cells that can be transplanted. In theory, cell-based therapies can treat conditions such as neurodegenerative disorders, diabetes, and cardiovascular disease. Stem cells have been used in a few treatments, but their full potential has not yet been realized. To use stem cells in a broader range of treatments, such as regrowing full organs, doctors need a better understanding of how stem cells work. Researchers also need to learn how resident stem cells maintain the tissues in our organs. It is not an easy task because these processes change during growth, differentiation, aging, and in response to environmental factors. The future looks bright as researchers are investigating ways to apply stem-cell treatments for conditions such as diabetes, heart disease, neurodegenerative diseases, such as Alzheimer’s and Parkinson’s disease and other conditions. Scientists are already using stem cells in the laboratory to screen new drugs and to study normal human growth as well as identifying the causes of birth defects. Research on stem cells continues to advance knowledge about how to replace damaged cells in adult organisms. Offering promise to treat human disease and aging, stem cell research raises scientific questions as rapidly as it generates discoveries. You can learn more about stem cells and how geroscientists are looking for ways to reverse stem cell decline in these two related articles. Diagnosis, Treatment, and Advice: This article is intended for educational and informational purposes only and is not a substitute for professional medical advice. The information and opinions provided herein should not be used during any medical emergency or for the diagnosis or treatment of any medical condition. Consult a licensed and qualified physician for the diagnosis and treatment of any and all medical conditions. Dial 911, or an equivalent emergency hotline number, for all medical emergencies. As well, consult a licensed physician before changing your diet, supplement or exercise programs. Endorsements, Photos, and External Links: This article is not intended to endorse organization, companies, or their products. Links to external websites, mention or depiction of company names or brands, are intended for illustration only and do not constitute endorsements. 1. Human Embryonic (hESCs) and human induced pluripotent stem cells (hiPSCs) are inherently problematic for developing stem cell transplant therapies. Both contain chromosomal mutations that contribute to tumor formation when returned to human tissues. The same mutations may also cause deficiencies in mature cells derived from them. 2. An even more problematic deficiency is that both hESCs and hiPSCs lack the special property of adult tissue stem cells (ASCs; also known as distributed stem cells, DSCs) that is required for continuous maintenance and repair of tissues in children and adults. Called asymmetric self-renewal, this is the ability of ASCs to continuously produce mature functional cells as they are needed without losing their own stem cell character. This property, unique to ASCs, is essential for life and health. In contrast, hESCs and hiPSCs convert into functional tissue cells with the coincident loss of their own stem cell character. 3. The common statement that “hESCs and iPSCs can produce any cell in the body” is now known to be erroneous. In fact, these stem cells typically turn into functional tissue cells more like those found in fetuses. Much research is ongoing to try to instruct them to produce functional tissue cells that are found in children and adults and needed to treat disorders in their tissues and organs. Hi – I added more advanced articles on stem cells. With the following section. Sherley, J. L. (2008) “A New Mechanism for Aging: Chemical ‘Age Spots’ in Immortal DNA Strands in Distributed Stem Cells,”Breast Disease 29, 37-46. I should thank you, instead Dr. Sherley. I always appreciate another set of eyes, Especially medically-trained specialist eyes such as yours.